Sarah Janece Garcia was inspired by the belief that, like the giraffe, we can all rise to the challenge. The stunning giraffe stands head and shoulders above other animals, reaching incredible heights to get whatever it desires. 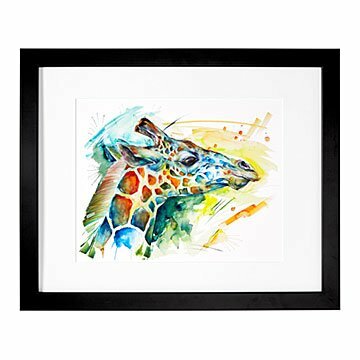 This portrait of the sky-high herbivore by Sarah Janece Garcia was inspired by the belief that, like the giraffe, we can all rise to the challenge and achieve our dreams. According to legend, it is believed that the giraffe is a messenger that appears in our psyche when the time comes to stretch ourselves beyond what we believed possible. Painted with sumptuous splashes of color, The Dreamer captures this concept by reminding us to lift our heads up and pursue our passions. Made in Dallas, Texas. Printed and framed in Portland, Oregon.